From the Main Menu access Options. 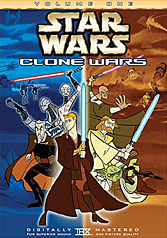 Type in with your dvd remote 1 1 3 8 as in other Star Wars DVDs, and you will be taken to a credits list with stills from the clone wars cartoon in the background. Typing this in can be confusing because DVD players can be different about how they allow you to type in numbers. You might have to press the +10 button, then 1, after a second press 3, then after another secong press 8 in order to access this feature.